The Lakeland Chiefs were defeated by the Loyalsock Lancers in the first round of the state playoffs on Monday 10-5. Danny Pittack double in 2 runs for the Chiefs. The Chiefs finished the 2009 season with a record of 13-6 and were the 2009 District II AA Champions. The Chiefs reach the District II AA final for the first time since 1989 with a 6-5 victory over #2 seeded Riverside. Brandon Shimo went the distance striking out 5 to pick up the win. Danny Pittack had 3 hits and drove in 3, with a big 2-run homer in the top of the 7th. Geoff Demming had 2 hits (double) and drove in 2 to lead the Chiefs. The District II AA semi-final game was suspended in the top of the 2nd inning. The Chiefs have a 4-0 lead over Riverside. Danny Pittack was named Scranton Times' Athlete of the Week. Pittack was 5 for 6 in two playoff games and pitched a complete game over Hanover with 12 strike outs. The Chiefs rally from 3 runs down in the sixth inning to make it a 4-3 game Hanover. Then score 4 in the top of the seventh to seal the game to win 7-4. Danny Pittack went the distance giving up only 3 singles and was plagued with some less then stellar defense at times. Pittack gave up 0 earned runs while striking out 12 Hawkeyes. Geoff Demming had the 2 big hits for the Chiefs. He hit a 2-run double into the gap in the sixth inning and hit a pea at the third baseman with the bases loaded to score 2 more runs. The Chiefs defeated the Dunmore Bucks 4-3 in the first round District II AA playoff game. Brandon Shimo went the distance giving up 4 hits and striking out 5. With those 5 strike outs, Shimo becomes the all-time single season record holder with 79 passing Trevor Tellip with 75. Danny Pittack led the offense with 3 hits and Geoff Demming had a double and triple while driving in 2 runs. The Chiefs will play Hanover on Friday 5/22/09 at Hanover High School. The Chiefs earned the #6 seed in the District II AA playoffs. They will play a home game against Dunmore with the winner playing the winner of the #3 Hanover Area/#14 Carbondale Area game. The Chiefs finished the regular season(9-5) with a win over Mid Valley 5-2. Danny Pittack went the distance giving up 6 hits and striking out 11 to pick up the win. Josh Burge had 2 RBIs and Kevin Carito drove in 1. The Chiefs had a lack luster performance with the bats in a 4-0 loss to Dunmore. Dom Massino and Kevin Carito had the only hits for the offense. The Chiefs 6 game winning streak was stop in 9 innings with a 2-1 decision to Valley View. Danny Pittack was the tough luck losing pitcher going the distance and striking out 12. Dom Massino had 3 hits for the Chiefs. The Chiefs won their 6th game in a row with a convincing 7-1 victory over Old Forge. Brandon Shimo (6-1) went the distance allowing only 4 hits and striking out 7. Ethan Calafut got the ball going, with a solo shot in the 1st, he finished with 2 hits(HR and 2b) and 2 RBIs. Dan Pittack also hit a solo home run and Dom Massino hit a 2-run double in the 4th inning. The Chiefs won for the 5th straight time 4-2 over the Carbondale Area Chargers. Brandon Shimo (5-1) went the distance giving up 5 hits while striking out 12. Ethan Calafut set the tone with a run scoring triple in the 1st inning. Calafut finished 2 for 2 with 2 RBIs. The Chiefs gave the Riverside Vikings their first loss of the season 4-2. Danny Pittack (2-2) went the distance giving up only 6 singles (3 in the 2nd inning) and striking out 8 Vikings. Kevin Carito had the big 2 out 2 run base hit in the 4 inning to send the Chiefs to victory. Ethan Calafut and Geoff Demming had 2 hits a piece. Pittack also had run scoring double in the 1st. The Chiefs win streak reaches 3 games in a row with a 9-5 victory over Holy Cross. Brandon Shimo (4-1) went the distance allowing 5 runs (2 earned) and striking out 14. Josh Burge and Vinnie Amacio each had 2 hits with a double. Geoff Demming drove in 3 runs, Burge and Kevin Carito each had 2 RBIs. The Chiefs scored early and often against Mid Valley enroute to a 12-0 mercy rule win. Danny Pittack was the pitching and hitting star throwing a 4-hit shutout with 9 strikeouts and going 3 for 3 with 5 RBIs with a 2-run mammoth homerun. Ethan Calafut also had 3 hits (2 doubles) and Josh Burge drove in 3 runs. The Chiefs got back on the winning trail with a 8-2 victory over the Dunmore Bucks. Brandon Shimo (3-1) went the distance giving up 7 hits and striking out 9 to pick up the win. Sean Pidgeon had 2 hits and drove in 3. Ethan Calafut also had 2 hits and scored twice. The Chiefs dropped their second game in a row, this time to Valley View by the score of 3-2. Brandon Shimo (2-1) was the tough luck losing pitcher allowing only 3 runs (0 er) on 5 hits and striking out 7. The Chiefs received another well pitched game from Dan Pittack but couldn't score the knockout punch. A walk-off homer in the bottom of the 8th inning defeated the Chiefs. The Chiefs edge the Chargers 3-1 at PNC Field. Josh Burge hit a 2-run double in the 4th inning to give the Chiefs the lead and then made a web-gem with a pick in the bottom of the 6th with 2 outs and runners on 2nd and 3rd. Brandon Shimo (2-0) threw another gem, going the distance allowing only 5 hits(all singles), and striking out 6. The Chiefs lost for the 1st time of the regular season on a suicide squeeze to Riverside in the bottom of the 7th 3-2. The Chiefs tied the game in the top of the 7th on Dan Pittack's long drive into the rightcenter gap for a double. Pittack went the distance on the mound only giving up 5 hits and striking out 8. Junior Outfielder Geoff Demming was named Scranton Times' Athlete of the Week. Chiefs Win With a Walk-Off Homerun 4-2!!!! Geoff Demming hit a 2-run walk-off homerun in the bottom of the 9th to send the Chiefs to their 1st league win of the season. Demming hit a 2-1 pitch deep to rightcenter for the victory. Brandon Shimo pitch a brillant 9 inning gem, throwing only 96 pitches, striking out 11 with an intentional walk. Geoff Demming also single in the tying run with 2 outs in the bottom of the 7th. Ethan Calafut, Sean Pidgeon, and Vinnie Amacio(solo HR) each had 2 hits for the Chiefs. The Chiefs lost their final pre-season exhibiton game to Mt. View 10-0 on Friday. The Chiefs will open up the regular season on Thursday, April 2 against Holy Cross. The Chiefs will be looking to have a "sucessful season" to qualify for the post-season. The Chiefs received solid pitching from Dan Pittack and Sophomore Joe Pryle to down Dallas 8-2. Sean Pidgeon (3-run) and Joe Wahy (solo) homered. The Chiefs played better baseball against Dallas taking a 3-1 lead into the bottom of the 7th. Brandon Shimo went a solid 6 innings giving up only 1 run. Dan Pittack hit a solo home run. The Chiefs continued to play shoddy defense while getting very good pitching from the younger Chiefs. Lakeland dropped the ball and the exhibition game 9-5 to Mt. View on a cold day in Mayfield. 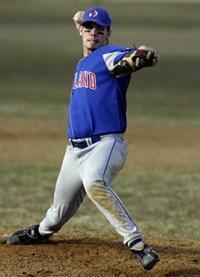 The 2009 Chiefs Baseball team opened up their preseason schedule with a doubleheader split with Bristol H.S. Game 1 saw three Chiefs' pitchers combined for a 2-hit shutout (2-0). In the nightcap, the Chiefs were ahead 4-0 on a Dan Pittack grand slam, when the wheels came off. The Chiefs gave up 8 runs(7 unearned)in the 3rd inning on their way to a 11-5 defeat. The J.V. team posted a 8-2 victory while getting solid pitching from 5 different hurlers. Ethan Calafut was named to the 2008 All-Regional team that was selected by the Scranton Times Newspaper. Ethan hit .341 with 18 runs scored, 3 doubles, a triple, and 1 home run. He drove in 9 runs from the leadoff spot and also was 12 for 12 in stolen bases. Defensively, Ethan threw out 9 would-be base stealers (9-18) (50%). Ethan was also selected 1st team division 2 coaches' all-league catcher. Chiefs Get Bounced From Playoffs 9-0!!!! The 2008 Lakeland Chiefs' season came to an end with a 9-0 thumping from G.A.R. The offense couldn't get anything going all afternoon with only 3 hits and 4 baserunners all game. Joe Wahy doubled, Pete Larioni and Josh Burge had the other hits for the Chiefs. The Lakeland Chiefs will open up the District 2 AA playoffs on the road as the 14th seed versus the #3 seed G.A.R. at Coal St. Park in Wilkes-Barre. G.A.R. finished the regular season at 12-2 in the Wyoming Valley Conference Division 3. The last time the Chiefs played G.A.R. was in the 2005 District 2 AA playoffs 2nd round, with the Chiefs coming out on top 11-1 in 5 innings. Chiefs Rally Past Valley View in 8 innings 6-5!!!!!! The Lakeland Chiefs rallied from a 5-0 score to tie the game at 5-5 in the bottom of the 7th with 2 outs on a Josh Burge single to send the game to extra innings. Then with 2 outs in the bottom of the 8th, Ethan Calafut doubled, Danny Pittack was int. walked, and Geoff Demming drew a walk setting the stage for Joe Wahy. Joe Wahy went with an 0-2 pitch down the leftfield line for the game winning walk-off RBI. Calafut finished with 3 hits and a RBI, Pittack and Wahy each had 2 hits and drove in a run. Brandon Shimo pick up the win throwing 4.1 innings of scoreless relief giving up just 3 hits and striking out 5. Chiefs Run Marathon Against Wildcats 21-11!!!! The Lakeland Chiefs had their hitting shoes on today bangging out 17 hits and scoring 21 runs to complete the sweep of the Western Wayne Wildcats 21-11. Geoff Demming was 4-4 with a double and a 2-run homer and finished with 5 RBIs on the day. Sean Pidgeon also hit a 3-run home run and had 3 hits with 5 RBIs. Birthday boy Pete Larioni had 2 hits along with Dom Massino. Demming picked up the win in relief going 5 innings while striking out 5. Chiefs Top Holy Cross 5-4!!!! The Lakeland Chiefs rallied from behind to defeat Holy Cross 5-4. Brandon Shimo had a 2-run single in the bottom of the 6th and then shut the door in the top of the 7th to earn the save. Shimo finished with 3 RBIs in the game. Danny Pittack went 6 innings while only giving up 4 hits in picking up the win. Geoff Demming had a double and a solo home run in the 1st. The Chiefs drop another sloppy played game this time to the Dunmore Bucks by the score of 10-2. Danny Pittack and Joe Wahy each had 2 hits. The Lakeland Chiefs only mustered 3 hits against the Old Forge Blue Devils in a 12-2 defeat. Dom Massino had a RBI single in the 2nd inning. Chiefs Pound The Vikes 16-4!!!! The Lakeland Chiefs pounded out 15 hits and scored 16 runs to race by the once beaten Riverside Vikings 16-4 in 4 and a half innings. Geoff Demming had 3 hits including a 2-run homer and double to drive in 3 runs. Ethan Calafut also had 3 hits. Danny Schlasta had 2 hits including a 2-run double in the first to start the Chiefs onslaught, he finished with 4 RBIs. Joe Wahy also finished with 2 hits. Dom Massino had 2 hits, one was a Grand Slam in the 4th, and had 5 RBIs. Brandon Shimo went the distance giving up just 4 hits while striking out 5 picking up his 1st victory on the season. Chiefs Defeat Valley View 10-6!!!!!! The Chiefs got their bats going against Valley View by knocking out 13 hits in a 10-6 victory. Danny Pittack had 3 hits including a double and a long 2-run homer (4 RBIs). Dom Massino also had 3 hits and Geoff Demming finished with 2 hits and drove in 2. Pittack picked up the win in relief of Demming. Ethan Calafut threw out 3 would be base stealers. The Chiefs gave up 8 runs in the second inning and couldn't recover for a 16-6 thumping by the Spartans of Mid-Valley. Joe Wahy hit a 2-run homer and Dom Massino had a 2-run double for the Chiefs. Chiefs Claim 1st Victory 3-0 over Wildcats!!!!! The Lakeland Chiefs claim their 1st league victory of the season with a stellar 3-0 victory over Western Wayne. Geoff Demming pitch a gem, giving up only 2 hits while striking out 4. The defense finally came to play making all of the plays. Dom Massino, Danny Pittack, and Jimmy Richardson each played well defensively. Pittack led the offense with 2 hits, Demming and Joe Wahy each had a RBI. Ethan Calafut stole 3 bases. The Chiefs continue to struggle in the field and at the plate while having more errors than hits. Holy Cross was the 5th straight team to beat the Chiefs 12-2. The Chiefs are off to their worse start in 12 years after dropping a 8-2 decision to Dunmore. The team managed just 4 hits in the loss. The Chiefs lost another 1 run game (third in a row) to Old Forge 5-4. The Chiefs scored the apparent tying run in the 7th only to have the baserunner put back at third when the ball was ruled out of play. Brandon Shimo took the tough loss again, pitching well enough to win. Danny Pittack had 2 hits including a double and 1 RBI, Ethan Calafut also doubled and had 1 RBI. The Chiefs committed 8 errors which lead to 6 unearned runs in a 8-7 defeat to the Riverside Vikings. Geoff Demming had 2 hits and drove in 3 runs and Ethan Calafut homered. The 2008 Lakeland Chiefs opened the season with a tough loss to the Mid-Valley Spartans 3-2. The Chiefs' hitters didn't have much success against the Spartans' pitchers by striking out 17 times. Brandon Shimo was the tough luck loser going the distance while only giving up 4 hits and no earned runs. The Chiefs lost a slugfest to Dallas H.S. by the score of 11-10 at The Ballpark in Mayfield. The Chiefs will battle Carbondale tomorrow 3/28/08 at The Ballpark in Mayfield starting at 4:30pm. The Lakeland Chiefs won their 4th game of the year with a score of 4-2 over Dallas. Dan Pittack went 5 innings giving up only 1 run. Geoff Demming finished off the final 2 innings picking up the save. The two teams will play again tomorrow 3/27/08 at The Ballpark in Mayfield with a 4:30pm start. The Chiefs rebounded from Monday's loss with a 10-4 win over the Mt. View Eagles on a cold March day. Brandon Shimo gave up only 1 run going 5 innings. Joe Wahy hit a 2 run Homer to break a 1-1 tie. The Chiefs are back in action again on Wednesday March 26 at Dallas H.S. with a 4:15pm start time. The Chiefs got left on the field when the Mt. View Eagles scored 3 runs in the bottom of the 7th for a 5-4 victory giving Lakeland Assistant Basketball Coach and Head Mt. View's baseball coach Ryan McAndrew his 1st career victory. Congrats to Coach McAndrew. The two teams will be at it again tomorrow with a 4:30pm start time at The Ballpark in Mayfield. The Chiefs opened their 2008 season in fashion with a doubleheader sweep of Bristol H.S., 6-5 and 9-5 on Saturday. Game 1 was play with the temperature around 47 degrees,partly cloudy and windy, but game 2 saw great weather of 60 degrees and sunny. The J.V. team dropped their game by the score of 9-6. The Chiefs have scheduled their annual Philadelphia trip for Saturday March 15 vs. Bristol H.S. Then the Chiefs have a series of home and home games with Mt. View H.S. on March 24 and 25 and Dallas H.S. on March 26 and 27. The Chiefs complete their Spring Training with a game with Carbondale H.S. on March 28. All games are subject to change depending on weather. The 2008 Chiefs open their regular season on Thursday April 3 vs. Riverside. Check back for updates. Chiefs End Season with Loss to Blue Ridge 17-13!!! The Chiefs open the District 2 "AA" playoffs with a tough loss to the Blue Ridge Red Raiders 17-13. The Chiefs had plently of offense, hitting 3 homeruns and scoring 13 runs but didn't get the big hit when it was needed. Matt Norton, Spencer Clauss-Walton, and Drew Simonik had the homeruns. Chiefs Open District 2 Playoffs on the Road!!!! The #9 seed Chiefs (11-5) will open the District 2 AA playoffs at the #8 seed (11-5) Blue Ridge Red Raiders. The winner will play the #1 seed Mt. View/#16 Montrose/#17 West Side Tech winner on Friday May 25. The Chiefs finished the regular season with a 2-0 win over Mid-Valley. The win gives the Chiefs a record of 11-5. Drew Simonik went the distance scattering 6 hits while striking out 9. Simonik also lead the Chiefs with 2 hits. The Chiefs did what no other area team could do in baseball or basketball in the regular season this year and beat an Old Forge team 4-3. The Blue Devils coming into the game had a perfect record of 14-0 (Basketball team had a record of 28-0 before losing late in the state playoffs). Adam Grabowski was dominating on the mound. He went the distance striking out 7 and giving up only 5 hits. Freshmen Geoff Demming and Danny Pittack came up big for the Chiefs. Demming drove in the first two runs for the Chiefs to take a 2-1 lead and Pittack had a walk-off single with the bases loaded in the bottom of the 7th to win the game. Ethan Calafut and Drew Simonik were two time hitters for the Chiefs. The Chiefs gave up two 5 run innings and could not recover and lose for the second time to the Dunmore Bucks 14-4. Anthony Besten and Freshman Geoff Demming each had 2 hits. Besten and Adam Grabowski each homer giving the Chiefs 8 different players who have homered on the year. The Chiefs gave their moms something to cheer about on Mother's Day by drilling Bishop Hannan 14-5. Freshman Danny Pittack went 4+ innings to pick up his first career varsity win and he also drove in 4 runs on 2 hits. Spencer Clauss-Walton, Adam Grabowski, Jack Delfino, and Ethan Calafut each had 2 hits. Calafut became the 6th different Chief to homer on the year. Drew Simonik was on top of his game against the Valley View Courgars, he struck out 9 and did not walk a batter while holding the courgars in check for 4 hits. Simonik drove in the first run with a sac fly in the first and the Chiefs scored the second run on a wild pitch in the 4th inning. The Chiefs ended the game with a strike him out throw him out doubleplay as Ethan Calafut's throw and Brandon Shimo's scoop perserved the 2-1 win. The Chiefs bounced back after a 10-0 drubbing and defeat the Riverside Vikings 8-2. Sophomore Brandon Shimo kept the Viking hitters off their game picking up the win while striking out 5. Adam Grabowski had 2 doubles, while Drew Simonik and Ethan Calafut each drove in 2 runs. Matt Norton hit a solo homer in the 3rd. The Chiefs lost their third straight game 10-0 in 6 innings against the Riverside Vikings. Chiefs' starter Adam Grabowski was victimize of 7 errors. Grabowski struck out 9 and didn't walk a batter. The Chiefs took an early 2-0 lead behind the power of Drew Simonik's 2-run homer in the first but couldn't hold on against the Old Forge Blue Devils(10-0). Danny Pittack double in the 7th and Spencer Clauss-Walton singled him home to close the gap to 5-3 with the trying run at the plate but the devils induced a game-ending doubleplay. Chiefs Game with Bishop Hannan Postponed! The Chiefs game vs. Bishop Hannan has been postponed due to poor field conditions. The game will be played on Sunday May 13 at 1:30pm at Sloan field in West Scranton. The Chiefs could not come up with the big hit and fall to Mid-Valley 11-7. Adam Grabowski lead the Chiefs' offense with 2 hits. Drew Simonik and Dan Pittack each homered, driving in 3 and 2 runs apiece. The Lakeland Chiefs took a pair of games from the Western Wayne Wildcats 11-1 and 17-2. In game 1, Jack Delfino, Matt Norton, and Willy Tratthen each had 2 hits. Delfino drove in 2 runs with a homerun. Sophomore Brandon Shimo went the distance giving up just 3 hits while striking out 9 to pick up his first career varsity win. In game 2, Drew Simonik and Matt Norton each had 2 hits to lead the Chiefs. Simonik's hit were a double and triple. Spencer Clauss-Walton added a solo homer. Corey Petrokonis went 3 innings to pick up the win for the Chiefs. The Chiefs used a four run 4th inning rally to overcome an upset minded Bishop O'Hara team. The highlight of the 4th inning was Matt Norton's 3-run homer to deep right center, his second in as many games. Drew Simonik went the distance, giving up just 4 hits while striking out 10 to pick up the win. Simonik also led the offense with 2 hits and a RBI. Matt Norton's 3rd inning grand slam provided the fireworks for the Chiefs against Valley View. Norton hit a 1-0 fastball deep over the left fence to give the Chiefs a 8-1 lead. Drew Simonik led the Chiefs with 3 hits, two going for doubles. Adam Grabowski went the distance looking very sharp. He gave up 5 hits while striking out 8 to pick up the win. Dunmore outlasts the Chiefs 10-7!!! Despite giving up 14 walks, the Dunmore Bucks were able to hold off the Lakeland Chiefs 10-7. The Chiefs left runners on 1st and 2nd in the bottom of the 6th and the bases loaded in the 7th without getting the timely hit. Freshman Danny Pittack led the offensive again with 2 hits and 2 more RBIs. Ethan Calafut and Anthony Besten each drove in 2 runs. The Chiefs took a 4-0 lead after 2 innings but Bishop Hannan tied the game in the top of the 7th off relief pitcher Drew Simonik. With aggressive baserunning by Adam Grabowski and a perfectly executed safety squeeze by Spencer Clauss-Walton, the Chiefs squeezed by the Lancers 5-4. Grabowski pitched 6 strong innings striking out 9 but received a no decision. Freshman Danny Pittack continued his strong start with a 2 run double in the first. Chiefs open 2007 with 16-0 Clubbing of O'Hara!!! The Chiefs opened the 2007 Season with a win over Bishop O'Hara 16-0. Drew Simonik went 3 innings picking up the win while striking out 7. Hitting stars were Matt Norton and Danny Pittack. Chiefs kick off 2007 season!!!!!!! Chiefs off to great start!!!! The Lakeland Chiefs have started 2005 with a roll. The Chiefs have won their first 8 games. With wins over Bristol (2), Dallas, Valley View, Montrose, West Scranton, Wesrern Wayne, and Scranton Prep the Chiefs are off to one of the best starts in team history. Chiefs rebound to defeat Mid Valley 4-3!!! The Chiefs were back in the win column with a victory over the Mid Valley Spartans 4-3. The Chiefs inprove their record to 5-4. Inconsistant Chiefs lose to Wildcats 8-6 to drop their record to 4-4. Chiefs use comeback to drop Montrose 9-3 for 4th win!!! The Chiefs improved to 4-3 with a win over Montrose. The Chiefs won by the score of 9-3. Chiefs top Prep 8-4 to even their record!!! The Chiefs defeated Prep 8-4 to improve their record to 3-3. The Valley View Cougars defeated the Chiefs 12-2. The loss dropped the Chiefs record to 2-3 for the season. Chiefs pound Carbondale 16-4 for 2nd win!!!! Chiefs use comeback to defeat Mid Valley 4-3!!!! The Chiefs wrapped up their Spring Training trip with a record of 3 wins, and 3 losses. The Chiefs' bats were in midseason form. The defense was also a bright spot. The Chiefs open the regular season on Tuesday April 6, 2004 if the weather cooperates. Chiefs catch(er) break against Prep 8-7!!! The Lakeland used a 7th inning rally, and a pre-mature celebration by a Catcher to defeat Prep 8-7 on Monday. The win allows the Chiefs to continue on in the State playoff hunt. The Chiefs were down 7-2 entering the 7th inning. They cut the lead to 7-4, and had the bases loaded. With two outs the Chief hitter struck out swinging, but the catcher scooped the ball. The catcher needed to tag the batter, or step on the plate to end the game. Insted he goes into celebration mode, and fires the ball over the right field fence. Once order was restored it was determined that two runs were in, and the Chiefs had runners on second and third. The next hitter was walked to load the bases. The next Chief hitter was once again struck out swinging, but the ball got past the catcher. The tying run scored, and the runner from second came around to score the winning run. TEAM OF DESTINY??????? Maybe..... Starting pitcher Tony Grande picked up the win striking out 8. Adam Calafut was 3-4, with 2 doubles. The Chiefs will be back in action on Wednesday when the face the Dallas Mountaineers. The game will be at 4:30 PM at Chiefs Stadium. Chiefs defeat Montrose 14-9 for 12th win...Clinch Lackawanna Title!!!! The Chiefs defeated Montrose 14-9 on Wednesday to improve their record to 12-2. With the win the Chiefs clinched at least a tie for the Lackawanna League Championship. Valley View has to win their final two games to tie the Chiefs as Champs. Steve Racht turned in another fine pitching outing as he went 5.2 innings picking up the win. The bats were led by Seth Tratthen 3-3, double, 3 RBI, Howie Howarth 2-3, triple, 4 RBI, Keith Allen 2-5, double, 2 RBI, and Mike Ciuccoli 2-4. The Chiefs now will wait to see where they will be seated for the playoff tournament. Check back for the next game time, and place. Chiefs bury Prep 13-3 for 11th win!!!! The Lakeland Chiefs buried Scranton Prep 13-3 in six innings on Monday for their League Leading 11th win. Starting Pitcher Tony Grande went the distance picking up the win. Grande allowed only 3 hits, and 3 runs while striking out 10. Every player on the Chiefs roster played in the game. The Chiefs pounded out 14 hits. Leading the way with the bats were Seth Tratthen 3-4, double, RBI, Jason Shifler 2-2, double, 3 RBI, Adam Calafut 2-3, 2 RBI, Dave Duchnik 2-3, RBI, and Trevor Tellip 1-1, double, 4 RBI. The Chiefs have one regular season game left before the playoffs start next week. Chiefs EXTINGUISH Cougars win streak 12-4 for 10th win!!! The Lakeland Chiefs EXTINGUISHED the redhot Valley View Cougars' 10 game win streak with a 12-4 clubbing over the formally undefeated team. Starting pitcher Tony Grande went the distance picking up the win. Grande allowed 8 hits, and struck out 9. The bats were led by Jason Shifler 3-5, double, 3 RBI, and Trevor Tellip 2-4, Homerun, 2 RBI. The Chiefs are now 10-2, and only a half game behind the Cougars. The Chiefs are back in action on Monday May 12, 2003. Chiefs ring-up Chargers 14-10 for 9th win!!! The Lakeland Chiefs continued their winning ways on Thursday with a 14-10 win over the Carbondale Area Chargers. The win inproves the Chiefs record to an impressive 9-2. Starting pitcher Seth Tratthen went 5 innings to pick up the win. Tratthen received some relief help from Howie Howarth who pitched 2 innings, and recorded the save. The Chiefs pounded out 14 hits. Leading the offensive were Keith Galinsky 3-5, triple, 2 doubles, 4 RBI, Jason Shifler 3-5, 2 doubles, 4 RBI, and Trevor Tellip 3-5, 2 RBI. Howie Howarth chipped in with two hits, one a double, and 2 RBI. The Chiefs now await a show down with first place Valley View on Monday. Chiefs clip Chargers 10-4 for 8th win!!! The Chiefs defeated the Carbondale Chargers 10-4 on Tuesday to improve their record to 8-2. Steve Racht picked up the win in relief of Trevor Tellip. Racht went 4 innings without allowing a run to take his record to 2-0. Keith Galinsky was 3-4, double, RBI, Adam Calafut drove in 3 RBI, and Howie Howarth added two hits including a double. The Chiefs' record now stands at 8-2. Chiefs tag Bucks 8-3 for 7th win!!!! The Lakeland Chiefs defeated the Dunmore Bucks 8-3 on Monday to improve their recond to 7-2. Starting pitcher Tony Grande went the distance allowing 3 runs on 5 hits, striking out a season high 13 picking up the win. 5 different Chiefs drove in a run. Adam Calafut was the only Chief to crack the two hit mark. Chiefs are back at it again tomorrow when they face the Carbondale Chargers. Game time is 4:30 PM at Chiefs Stadium. It was suppose to be an EXHIBITION!!!! Chiefs win 6-4 over Warriors!!! The Chiefs defeated the Warriors 6-4 in a exhibition game held at Lackawanna County Stadium. Jimmy Yesalavage picked up the pitching win. Seth Tratthen was 3-3, 3 RBI, and was named game MVP. Other Chiefs with two hits were Jason Shifler, and Howie Howarth. Chiefs beat Montrose in photo finish 11-10!!! The Chiefs needed 8 innings to defeat Montrose 11-10 on Friday. Starting pitcher Trevor Tellip dominated the first 4 innings striking out 9 allowing the Chiefs to build a 8-0 lead. Montrose came back to make a game of it tying it at 10 by the 7th inning. Jason Shifler entered the game in the 7th and recorded the final 2 outs, and pitched a scoreless 8th to pick up the win. Trevor Tellip knocked in the winning run in the bottom of the 8th to give the Chiefs the victory. The offense was led by Keith Galinsky 3-3, double, RBI, Keith Allen 2-5, 2 doubles 2 RBI, Howie Howarth 2-4, double, 2 RBI, and Mike Ciuccoli 2-4, RBI. The Chiefs are now 6-2. Chiefs use comeback to defeat Wildcats 13-9!!!! The Chiefs had to comeback from 9 runs on Thursday to defeat the Western Wayne Wildcats 13-9 for their 5th win. Starting pitcher Seth Tratthen was victim of some poor fielding as he only lasted 1 inning giving up 9 runs (4 earned). Enter Steve Racht. Racht pitched the final 6 allowing 0 runs on 5 hits picking up the win, and gave the Chiefs a chance to mount a comeback. The Chiefs scored 7 in the 4th inning, and 6 in the 6th inning to charge back to victory. Leading the way offensively were Adam Calafut 3-3, double 3 RBI, Jason Shifler 3-5, double 3 RBI, Howie Howarth 2-2, 2 RBI, and Seth Tratthen 2-4. The Chiefs are now 5-2. The Lakeland Chiefs dropped a tough one on Wednesday to the Mid Valley Spartans 3-2. Starting pitcher Tony Grande pitched well enough to win, but the Chiefs offense came up a little short in the bitter cold. Grande allowed only 4 hits, and 2 earned runs while striking out 8. The Chiefs bats were led by Jason Shifler who was the only Chief with 2 hits. Shifler also had one of the two RBI. The Chiefs are now 4-2. Chiefs club Dunmore Bucks 15-0 for 4th win!! The Lakeland Chiefs clobbered the Dunmore Bucks 15-0 on Saturday to improve their record to 4-1. Starting pitcher Seth Tratthen went four innings allowing only 3 hits picking up the win in a mercy shortened game. The Chiefs bats were once again on fire as they collect 14 hits in four tries. Leading the offense was Adam Calafut 3-4, Grandslam Homerun, 5 RBI. Chiefs with two hits included Jason Shifler 2-4, double, Trevor Tellip 2-3, double, RBI, Seth Tratthen 2-3, RBI, and Keith Allen 2-3, 2 RBI. The Chiefs' record now stands at 4-1. Chiefs claw Wildcats 8-7 for 3rd win!!! The Lakeland Chiefs defeated the Western Wayne Wildcats 8-7 on Thursday to improve their record to 3-1. The 3-1 record is currently good for second place in the Lackawanna League. Starting pitcher Mike Ciuccoli went 4 innings allowing 8 hits, and 6 runs picking up his first win of the season. Howie Howarth relieved going 3 strong innings allowing only 1 hit, and an unearned run picking up his first save of the season. The Chiefs bats were led by Keith Allen 2-2, 2 RBI, Trevor Tellip 2-4, Dave Duchnik 2-3, double, 2 RBI, Howie Howarth 1-3, double, RBI, and Seth Tratthen 1-4, 2 RBI. The Chiefs have won three in a row. Chiefs bomb Prep 14-3 for second victory!!! The Lakeland bats came to hit on Wednesday as the Chiefs pounded Scranton Prep 14-3 for their second win of the season. The Chiefs belted out 19 hits on their way to a season high 14 runs. Leading the way for the Chiefs were Seth Tratthen 3-5, 2 RBI, Adam Calafut 3-4, double, RBI, and Howie Howarth 3-4, RBI. Starting pitcher Tony Grande went six innings, striking out 7 picking up his first win of the season. The Chiefs are now 2-1. Chiefs top Spartans 7-6 for first win!! The Lakeland Chiefs entered the win column for the first time in the regular season by defeating the Mid Valley Spartans 7-6. Howie Howarth picked up the win in relief of Seth Tratthen. Trevor Tellip notched the save. Hitting standouts for the Chiefs were Jason Shifler 2 hits, (single, double) 1 RBI, and Keith Galinsky with a pinch hit RBI single. The Lakeland Chiefs opened the 2003 season with a tough loss to the Valley View Cougars 3-1. Starting pitcher Tony Grande pitched well enough to win, but came up short striking out 6 while only allowing two earned runs on five hits. The Lakeland bats were cold only managing five hits. The bright spots for the Chiefs were Jason Shifler 2-3, and Adam Calafut with a RBI Triple. Chiefs stung by Hornets 8-3...Head north for regular season!!! The Chiefs ended Spring Training with a 8-3 loss to the Honesdale Hornets. Bright spots for the Chiefs were Nate Hosie with two hits, and Jason Shifler with a double. The Chiefs will start the regular season on Wednesday April 2, 2003 when they face the Western Wayne Wildcats. The game will be played at Western Wayne starting time is 4:00 PM. Chiefs defeat Riverside Vikings 11-6!!! The Lakeland Chiefs ran their exhibition record to 4-1 with a come from behind 11-6 victory over the Riverside Vikings. Pitcher Dave Duchnik went two innings picking up the win. Leading the Chiefs' offense were Mike Ciuccoli with two hits, one RBI, and Nate Hosie with three RBI. The Chiefs will be back in action on Friday when the face the Hornets in Honesdale. Game time is 4pm. Chiefs down Blue Ridge 12-8 for third exhibition win!! The Chiefs continued their winning ways on Tuesday when they defeated Blue Ridge 12-8. Tony Grande pitched 4 strong innings striking out 7. The bats came to life with 4 Lakeland batters each collecting 2 hits. Howie Howarth had a Homerun, and a double. Jason Shifler had a triple, double, and 3 RBI. Tom Norton had two hits one a double, and 2 RBI. Brandon Calafut rounded out the hitting with two hits one a double. The Chiefs record stands at 3-1. The Chiefs defeated Lackawanna Trail on Monday 8-1. The Chiefs received a strong pitching outing from the combo of Seth Tratthen, and Howie Howarth. The two pitchers combined on a four hitter. Leading the Chiefs' bats were Tom Norton, and Jason Shifler who each had two hits. The Chiefs overall record stands at 2-1. Chiefs trip cancelled by Administration!!!!! The Chiefs trip to North Carolina was cancelled two hours before departure time by Lakelands Administration. The Chiefs will travel to Concord, North Carolina for a March 20th game against Robinson High School. Game time is scheduled for 4:30 PM. The Chiefs will continue the NC trip with two games against the number 5 pre-season ranked team in the state Mt. Pleasant High school. Friday March 21th game time is 4:00 PM, and Saturday March 22nd is 1:30 PM. Chiefs split doubleheader with Bristol 10-9, 5-18!!!! The Lakeland Chiefs opened their 2003 season with a split of a doubleheader against Bristol high school. The Chiefs won the first game 10-9. In the nightcap the Chiefs took their lumps 18-5. The Chiefs pounded out 21 hits in the doubleheader. Coach Vadala stated after the game, "We are very happy to get on the field this early in the year, and get two games under our belts." "I was pleased with where our hitting was this early in the season." "We will need to improve our defensive skills." "That will come with repetition, and games situations." Chiefs have 4 players named to All Star team! !Trevor Tellip named 'AA' Player of the Year! The 2002 Lackawanna League Champion Lakeland Chiefs placed 4 players on the League All Star Team. The players named were Mark Mushel (Catcher). Evan Kraky (Outfield). Jason Shifler (Secondbase). Trevor Tellip (Thirdbase and Pitcher). Tellip also received the Leagues highest honor when he was named 'AA' Player of the Year. This Honor is the second time for a player in Lakeland Baseball History!!. Zac Turissini was name Player of the year in 1989. Congratulation Trevor. Also, congratulation to all the players named to the 2002 Lackawanna League All Star team. 2002 was a GREAT year for Lakeland Chief Baseball. Chiefs fall to Meyers 1-0 in heartbreaking loss...Cross the finish line at 16-5 for the year!! The Lakeland Chiefs ended their remarkable season with a heartbreaking 1-0 loss against frequent playoff foe the Meyers Mohawks. The Chiefs received an outstanding pitching performance from Tony Grande. Grande allowed only one run on a wind-aided, to the shortest part of the park (315, the ball went 316), late swing homerun. The batter was the most surprised person in the park as he circled the bases. Grande pitched well enough to win, and deserved a better outcome. The Chiefs mounted several threats, but could not get the key hit or execute the key play at the right time. The Chiefs had only four hits with Evan Kraky picking up two, Mark Mushel, and Ken Meoni adding one each. Congratulation to the Meyers Mohawks. The Chiefs had an incredible run this season, and the baseball program is heading in the right direction. With the Chiefs returning a large amount of starters, including their top two pitchers there is no reason the Team will not be back in the hunt next season. This years team had some high points....A Lackawanna League Championship, tied for most wins in a season for any Lakeland Baseball team, several players jumped into the single season records section (UPDATED). So, although the season didn't end the way we wanted, 2002 may be the building block where Lakeland Baseball is on top for seasons to come. Congratulations to Coach Vadala, Coach Perri, and Coach Loftus for your work with the Varsity. Also, congratulations to Coach Barrett, and Coach Crotti for their work with the Jr. Varsity program. The players also deserve a big congratulations for the hard work, and dedication each and every one of them put in. 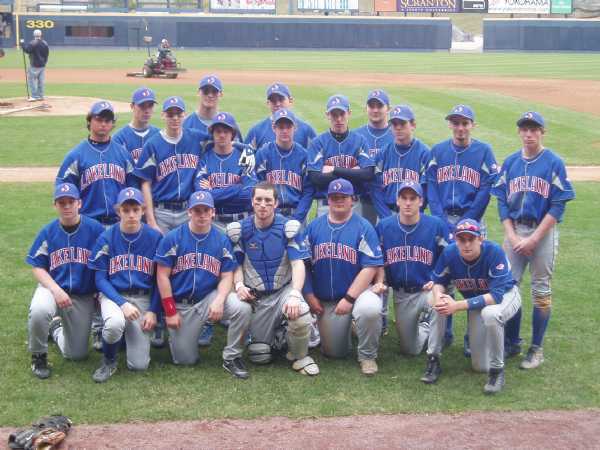 The 2002 Lakeland Chiefs.... Lackawanna League Champions!!! To the returning players 2003 could be a great year, continue the hard work, and keep improving. Final stats will be posted soon. Also, on a personal note, I enjoyed following the 2002 Lakeland Chiefs Baseball Team. 2003???? Chiefs defeat Comets 4-3 in Playoff heart-stopper!!!! The Lakeland Chiefs defeated the Crestwood Comets in dramatic fashion 4-3 on Tuesday. The Chiefs' playoff win was their first since 1989. The Chiefs used a bottom of the seventh strikeout to score the winning run. Starting pitcher Trevor Tellip went the distance, striking out 11 picking up his sixth win of the season. Tellip is now a perfect 6-0. The Lakeland offense which was held to three hits, managed to squeeze out four runs. Adam Calafut had a two run double. Jake Rogowski had a run scoreing double, and Mark Mushel had a single. Mushel's single led off the bottom of the seventh, and was the winning run. The Chiefs will be back in action on Friday 05/24/02 when they try to take one step closer to a district title. The Chiefs will face frequent playoff foe the Elmer L. Meyers Mohawks. The game will be played at Chiefs Stadium. Game time is 4:30 PM. Lakeland Chiefs The 2002 Lackawanna Legue Champions!!!! Congratulations to the 2002 Lakeland Chiefs Baseball team. Lackawanna League Champions with a record of 13-1. Chiefs defeat ESN in second half of doubleheader to finish 13-1!! The Lakeland Chiefs defeated ESN 13-4 in the nightcap. The Chiefs finished the regular season at an amazing 13-1 in route to a Lackawanna League Championship. Starting pitcher Kenny Meoni went the distance, striking out 10 in picking up his fourth win of the season. Meoni's record stands at a perfect 4-0. The Chiefs bats were led by Cris Criscera 3-3, 2 RBI. Trevor Tellip had a Homerun, 3 RBI, and Adam Calafut added a double, and 2 RBI. The Chiefs will host a playoff game on Tuesday May 21st at Chiefs Stadium. The games opponent is yet to be determined. Chiefs defeat the Dunmore Bucks 13-4 to clinch title!!!! The Lakeland Chiefs defeated the Dunmore Bucks 13-4 on Thursday for their 12th win of the season. With the win the Chiefs clinched the Lackawanna League "AA" Championship. Starting pitcher Tony Grande went the distance, striking out six, and picked up his fourth win of the season. Grande's record is now 4-1. The offensive explosion was led by Jason Shifler who was 4-5, 2 RBI. Evan Kraky, Mark Mushel, Trevor Tellip, and Kenny Meoni each had two hits. Mushel, Tellip, and Meoni each had a double, with Mushel and Meoni adding 2 RBI each. Evan Kraky had a Homerun, and 2 RBI. Lakeland defeats Western Wayne 11-0 for 11 win!!!! The Lakeland Chiefs defeated the Western Wayne Wildcats 11-0 on Wednesday to improve their record to a Lackawanna League Leading 11-1. Starting pitcher Trevor Tellip pitched a one hitter, and struck out 14 going the distance for the shutout. The win improves Tellips record to a perfect 5-0. The Lakeland bats were led by Evan Krakys' 2 hits, RBI, Kenny Meonis' 2 hits, and Mark Mushels' 1 hit, 2 RBI. The Chiefs wrap up the regular season on Thursday with a home doubleheader. First game is against Dunmore at 3:00 PM. With the second game against ESN 30 minutes after the first game is complete. If the Chiefs can win one of the two games they can wrap up the Lackawanna League Championship, and the first seed in the playoffs. Chiefs whitewash Montrose Meteors 9-0 for 10th win!!! The Lakeland Chiefs defeated the Montrose Meteors 9-0 on Tuesday for their Lackawanna League leading 10th win. Starting pitcher Trevor Tellip went the distance allowing only two hits, striking out 11 picking up his 4th win of the season. The Lakeland bats were led by Adam Calafut who had two hits, including a double, and two RBI. Mark Mushel had a double, and 3 RBI. Jason Shifler added two hits, one a double. The Chiefs will be back in action on Thursday when they roll out the welcome mat for ESN. The game time is 4:30. Lakeland faced the West Scranton Invaders in a exhibition game. The Chiefs lineup consisted of reserves, and youngsters. The West Scranton Invaders' more experienced team 10 run ruled the Young Chiefs in 5 innings. The Lakeland bats were led by Jim Yesalavage who had two hits, and Pat Gallagher who had a single. The Chiefs will be back in action on Tuesday when they welcome the Montrose Meteors to Chiefs Stadium at 4:30 PM. Chiefs defeat Scranton Prep Cavaliers 8-6 for 9th win!! The Lakeland Chiefs defeated the Scranton Prep Cavaliers 8-6 on Friday. The win takes the Chiefs record to a Lackawanna League leading 9-1. Starting pitcher Tony Grande went the distance, striking out 4, picking up his third win of the season. The Lakeland bats were led by Mark Mushel 2-4, triple, 3 RBI. Adam Calafut 2-4, double, RBI. Trevor Tellip 1-2, with a 2 run Homerun. The Chiefs will be back in action on Monday when they face the West Scranton Invaders in an exhibtion game at Lakeland Stadium. Game time is 4:30 PM. Chiefs defeat Valley View Cougars 10-6 for eighth win!!! The Lakeland Chiefs defeated the Valley View Cougars 10-6 on Friday for their Lackawanna League Leading eighth win. Starting pitcher Kenny Meoni went the distance striking out 5, picking up his third win of the season. Meoni's record is now a perfect 3-0. Hitting stars for the Chiefs were Jake Rogowski 3 hits including a double. Seth Tratthen 2 hits, 3 RBI, and Adam Calafut 2 hits, one a Homerun, and 2 RBI. The Chiefs will be back in action on Monday 04/29/02 when they face the Scranton Prep Cavaliers. The game will be played at 4:30 PM at a site to be determined. Chiefs defeat Mid Valley 7-3 for seventh win!!! The Lakeland Chiefs improved their Lackawanna League leading record to 7-1 on Wednesday. The Chiefs defeated the Mid Valley Spartans 7-3. The win returns the favor to the Spartans who handed the Chiefs their only loss earlier in the season. Starting pitcher Trevor Tellip pitched a complete game, allowing only three hits, striking out 12 and notching his third win of the season. Tellip's record now stands at a perfect 3-0. The Lakeland bats were led by Trevor Tellip's three hits, and two RBI. Jason Shifler, and Cris Criscera each added two hits. Mark Mushel homered, and drove in two runs. Kenny Meoni added two RBI. The Chiefs will be back in action on Thursday 04/25/02 when they host the Valley View Cougars. Game time is 4:30 PM. Chiefs tag Bucks ( Dunmore) 5-3 for sixth win!! The Lakeland Chiefs defeated the Dunmore Bucks 5-3 on Tuesday to record their sixth win of the season. Starting pitcher Tony Grande pitched a complete game, and struck out 10, picking up his second win of the season. Grande's record now stands at 2-1. The Lakeland offense was led by Jason Shifler who had three hits, and Trevor Tellip with two hits, and two RBI. The Chiefs will be back in action on Wednesday 04/24/02 when they travel to Mid Valley to face the Spartans. Game time start is 4:30 PM. Chiefs hammer Western Wayne Wildcats 10-0 in six innings for 5th win!! The Lakeland Chiefs crushed the Western Wayne Wildcats 10-0 in six innings on Thursday to improve their Lackawanna League leading record to 5-1. Starting pitcher Trevor Tellip pitched a one hitter with nine strikeouts in route to his second victory of the year. Tellip's record is now 2-0. The Lakeland bats were led by Trevor Tellip who was 3-3, and Evan Kraky who had two doubles, and two RBI. Mark Mushel and Seth Tratthen each had three RBI. The Chiefs will put their top record on the line on Monday April 22, 2002 when the face the Dunmore Bucks at Schaultz Stadium. Game time is 4:30 PM. Chiefs back in the win column 13-3 win over ESN for 4th win!! The Lakeland Chiefs defeated the East Stroudsburg Timberwolves 13-3 for their 4th win of the season. Starting pitcher Ken Meoni went six innings picking up his second victory of the season. The Chiefs bats were led by Evan Kraky who had two hits, and two RBI. Chris Criscera two hits (triple), and two RBI. The win improves the Chiefs record to 4-1 tied for the Lackawanna League lead. The Chiefs will be back in action Thursday 4/18/02 when they face the Western Wayne Wildcats at Chiefs Stadium. The starting time is 4:30 PM. The Chiefs dropped their first game of 2002 season with a loss against the Mid Valley Spartans 5-2. Tony Grande took the loss, his first of the season. That evens Grande's record at 1-1. The Chiefs had few bright spots, but Trevor Tellip and Jake Rogowski went deep with a solo homerun each accounting for the Chiefs two runs. The Chiefs will try to get back in the win column on Sunday when they play an exhibition game against Wyoming Area at Lackawanna County Stadium. Starting time 5:30 PM. Chiefs defeat Montrose 4-1 for third Straight!! The Lakeland Chiefs defeated the Montrose Meteors 4-1 for their third straight win!!! Ken Meoni went the distance allowing only one run in notching his first win of the season. The Lakeland bats were led by Trevor Tellip's Homerun, and Mark Mushel's RBI double. The Chiefs will be back in action on Friday April 12, 2002 when they host the Mid Valley Spartans. Chiefs shutout Cougars 6-0 for second Win! The Lakeland Chiefs defeated the Valley View Cougars 6-0 on Monday to run their record to a perfect 2-0. Trevor Tellip started, and went the distance throwing a three hit shutout, striking out twelve (10 in a row) picking up the win. The Lakeland offense was led by Mark Mushel with two hits, and two RBI. Jason Shifler, Jake Rogowski, and Trevor Tellip each added two hits. Chiefs win opener against Prep Cavaliers 7-4!! The Lakeland Chiefs defeated the Prep Cavaliers on Opening Day 7-4. Tony Grande started, and went the distance picking up the win allowing 4 runs on 7 hits. The Lakeland offense was led by Jason Shifler with two hits, and a RBI. Mark Mushel drove in two runs. The Chiefs will be back in action on Monday April 8, 2002 when the face the Valley View Cougars at Jessup Field. Starting time is 4:00 PM. The Lakeland Chiefs headed south to Philly to play a twinbill against Bristol. The Chiefs came away with two victories. In the first game the Chiefs won 6-3. The pitching trifecta of Tony Grande, Trevor Telip, and Brian Saslo held the Bristol hitters in check. Leading the Chiefs offensive attack were Chris Criscera 3-3 RBI, Jason Shifler 2-2, and Jason Scholtz 2-2 RBI. In the nightcap the Chiefs handed Bristol a 6-2 defeat. The Chiefs used a quintuplet of pitchers as 5 hurlers took the mound to hold Bristol to only two runs. Ken Menoni, Justin Wienshenk, Adam Calafut, Dave Duchnik, and Brian Saslo all logged time on the hill. Top hitters for the Chiefs were Trevor Tellip 2-2, 2 RBI, Keith Allen 2-2, 2RBI, Evan Kraky 1-2, 2 RBI, Jason Shifler 1-2, 2b, and P.J. Lemoncelli 1-2, 2b. The Chiefs will be heading to Virginia on March 26. Discover Yankees Tickets, Cardinals Tickets and Dodgers Tickets to watch your favorite MLB game live.